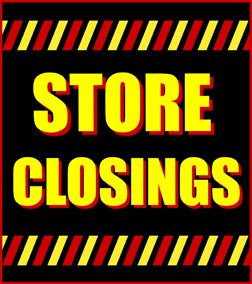 This store is scheduled to close for good on February 25, 2009. 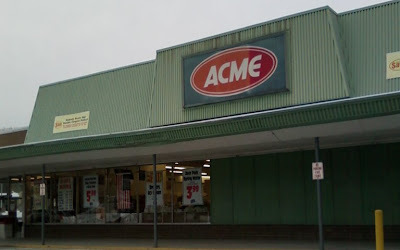 One of four Acme stores that will be closing. This store received the chain-wide remodel of the mid 80's. 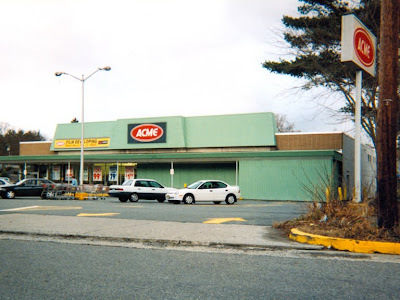 The Newton store was one of the last Acmes to be remodeled in North Jersey. Some stores, such as Sparta and Clifton, were passed over completely and kept their 70's colonial decor well into the 90's. The red oval logo was added in the 80's although all of the green sections were dark brown. They were painted green sometime in the late 90's or early 2000's. 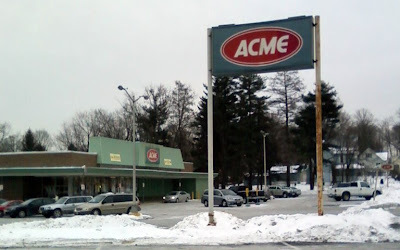 Strange that the sign was not updated to Acme's current logo. Many stores received this green treatment with the new logo regardless of any improvements made to the interior. This store did receive the "convience store" treatment which basically entailed removing any of the departments that were added during the 80's remodel such as the Seafood Department (if it was even still open for full-serice), salad bar, cheese from around the world and Floral Department. The 80's wall decor was also replaced with the blue and beige wall graphics that can be seen below. Outstanding location for the security lights! 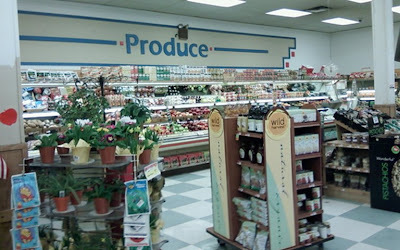 The Produce alcove was added during the mid 80's remodel. You can see where the wall used to be on the left-hand side of the photo (the corner right next to the plants). Most stores of this size had the Produce alcove added during the 70's remodel. That was not the case in this store. Get your smoked meats! The Floral Department of the 80's remodel was located on the right where the mac and cheese shelving is now. 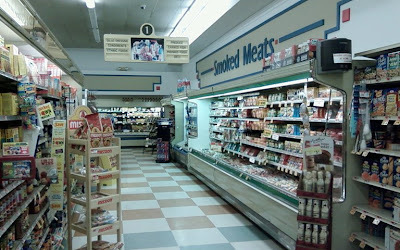 The full-service Seafood Department added in the 80's was located at the end of the aisle where the self-serve cases are now. Now serving #69. Really? 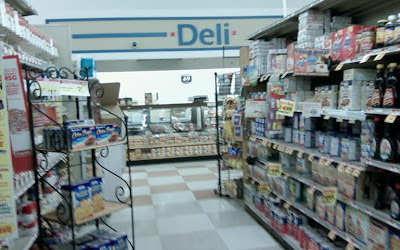 Notice the blue stripe to the right of "Deli" has fallen off. The air vents have caused "Meats" to be encrusted in black fuzz. Yum. Aisle 8: Dairy. The last aisle in the store. The "Dairy" wall graphics don't quite make it to the end of the Dairy Department. Very small in-store Bakery. The lattice is a relatively new touch. 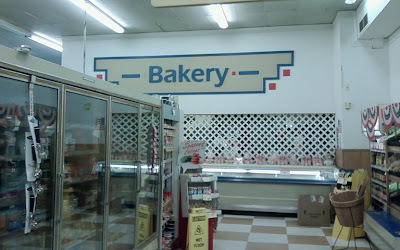 Notice the red block to the left of "Bakery" has fallen off. Prior to the mid-80's remodel, this are was where the customer service desk and store office was. The office is now much small and is located behind the bakery. The customer service department was replaced with the "CSR" stand that was located at the opposite end of the registers near the Produce dept. The CSR stand has long been removed and the express register now also serves as customer service. The CSR stand was an integral part of the mid-80's remodel but did not make any sense whatsoever. I believe they also referred to this as the "California front-end". Guess it was popular in Skaggs or something. The odd thing was that store safe was next to the CSR stand right out in the open. No walls or even a railing guarding it from anyone. Not that the safes were unlocked but it just didn't seem like a wise idea to expose the safes to everyone entering the store. 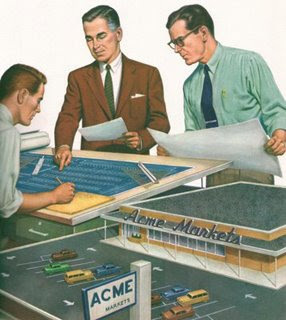 Fortunately in the 90's Acme reestablished the customer service counter and office in remodels and new stores. Here's a rare find... a picture of an Acme Super Saver. This image comes to us courtesy of Wyomming Valley Photo Blog... an extensive site of pictures and history of stores in the Wyomming area of Pennsylvania. Please check the Acme Style directory for a link to the site. 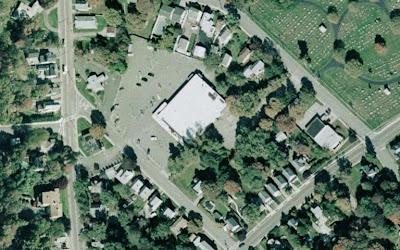 This store was located in Pittston Pennsylvania. It started out as a pitched-roof Acme and was converted to a Super Saver in the 70's. The awning was added at this time and disguises the pitched roof. I was able to get an image of the rear of the store on google map's street view. (See below) This store remained a Super Saver well into the 80's. You can see proof of this on the "Low Prices" banner which has the updated Acme logos of the mid '80s. The back of the store. Here it is after an update which probably occurred in the mid to late 90's. Most likely closing in the late 90's to early 2000's. 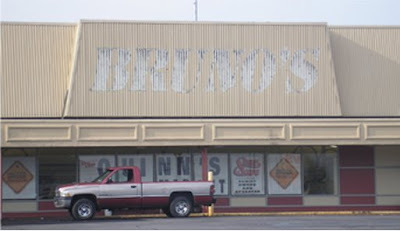 Bruno's with a fresh coat of paint. Quinn's opens in late 2008. Here's the amazing part of the story... according to Wyomming Valley Photos, the interior pitched-roof is still intact to this day! A drop ceiling has not been added after all of this time. I wonder how many other Acmes have gone through so many transformations and still have the pitched-roof intact. Thanks again to Wyomming Valley Photos for the images and for this history of this store! Check it out... Acme Style! This is a one in a million find on youtube. It's actually only part of a longer video for a TV station in Philadelphia. I managed to extract just the Acme commercial. Check it out Acme Style! Please share any other you may remember! A pitched-roof Acme ready for it's Grand Opening! This store is most likely not an Acme anymore... if the building is even standing. This rendering appeared on the back of Acme's courtesy card application well into the 90's. This style of Acme is referred to as the "pitched-roof" style. Stores like this were built throughout the 60's and very early 70's mostly in Pennsylvania. Many of these buildings still stand today but have been converted from Acmes to other retailers. This style of Acme is a favorite here at the Acme Style Blog and will be the focus of many posts to come. The Ambler store appears to be a classic 50's styled Acme with no major renovations over the years. It's surprising that this location has not closed sooner. The West Chester store on Rt. 322 is a different story. It opened in 2004 but had the unfortunate luck of being located close to a Giant Food Store. Giant is known for it's aggressive pricing and huge selection. The chain continues to spread eastward into Acme's territory. The Collegeville store first opened in 1967 and relocated to a larger space in the mid 70's. 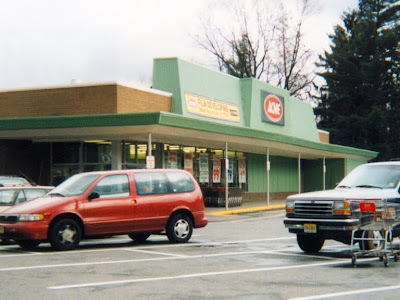 The store was expanded and remodeled in the mid 90's. This location also has competition from two nearby Giants. The Newton store opened in the late 50's. 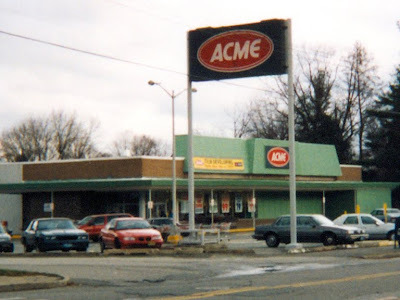 A classic stand alone Acme in a residential neighborhood. 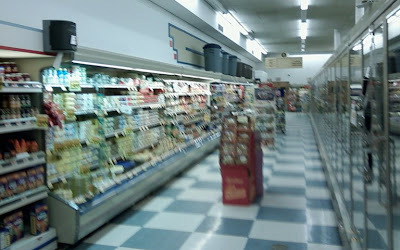 The store received the extensive mid 80's remodel that swept most of the chain. The interior was expanded slightly but the store remained small with only 8 aisles. 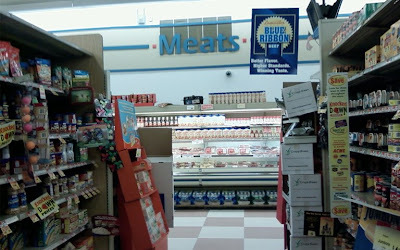 In the late 90's the department signage was upgraded to the blue and beige "convenience store" look with no other upgrades. The red oval logo remains on the outside of the store. I will be posting pictures of this store soon. Ambler will close later this month. West Chester, Collegeville and Newton are scheduled to close on February 25. This is how the store in the rendering below would have looked when it was built. A classic 50's-early 60's Acme. As these stores continued to be built, the script logo was made smaller and smaller. I remember the Acme in my town had this logo and several of the letters had fallen backwards. This rendering shows the style of Acmes built throughout the 50's and earlu 60's as grocery stores moved off of main street and into stand alone locations. This prototype gave way to the pitched-roof style of the mid to late 60's which is a favorite here at the Acme Style Blog.